Termites, coming from both underground and flying through the air, swarm and can cause damage to the structure and stability of your home with little to no warning signs. By their nature, termites venture into the dark parts of your home or business, between the walls that you cannot see, and have a buffet on the structure of your home or business. Over time, the structural integrity of your home or building weakens into a collapsed state or such that it can longer support the loads for which it is designed pursuant to the Florida Building Code. Fortunately there are warning signs to look out for to catch the problem before the termites completely eat your home or business. Some of the most common warning signs are buckling or bowing of floors, walls, and ceilings. Additionally, termite droppings which look similar to dirt and wings are common signs that termites are present and swarming. Some of the more uncommon or unrecognizable signs of termites are what is called a “mud trail” which is a brownish looking stain similar to a water stain, and the smell of mold or mildew. Many people do not know that such damage may be covered by their homeowners insurance policy or commercial insurance policy. Coverage for termite damage is commonly found in a separate section labeled collapse coverage. 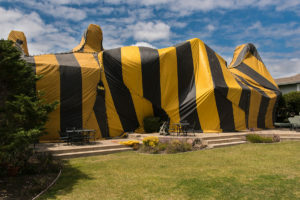 However, as written, it is difficult to interpret the insurance policy language leaving many people to believe that their insurance policy does not cover termite damage, when it, in fact, may. Makris & Mullinax, P.A. is a Tampa Bay insurance claim law firm specializing in homeowners insurance claims and commercial property insurance claims, including termite insurance claims and collapse insurance claims. If you experienced damage to your home or business caused by termites, please contact us promptly for help. If your insurance company is delaying your termite or collapse claim, denied your termite or collapse claim, or underpaid or low-balled your termite or collapse claim, contact us today. Makris Law is an insurance claim law firm that specializes in handling insurance claims for homeowners and property owners from beginning to end, including litigation.